A fantastic result ! Well done !! Great next stop ought to be Maori parliment seats. Multi culturalism reigns thank goodness in the minds of the thinking majority. This racist division Must be stopped if it’s not too late already with our successive socialist governments who have re written the Treaty and now teaching the lies in our schools. In true maori trougher fashion, they will just keep going year after year until they win. A win today for us but they never give in until they get what they want. With the education system brainwashing our youth and older kiwis dying off, it is only a matter of time. Very well done. Until 1980s, we prided ourselves on being equal in NZ. I strongly opposed racist chosen All Black trips to South Africa and I also strongly oppose the racist nonsense being paraded today by activists. 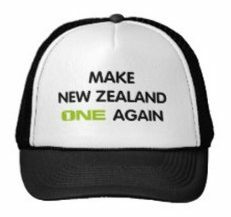 Let’s also get rid of Maori seats MPs. the thing is they can have another go after the next two local body elections. The good news is it will put other councils off as this was a test case. It good to see that five councils have rejected apartheid and it’s about time part-Maori stopped getting hand outs given to them by the politicians and stood up for themselves and move on like every other race. They weren’t the first here and their culture was taken off the people that were here before them.